In the lead-up to the NFL draft a great deal of attention is paid to the Combine, and understandably so. However another part of the draft preparation for NFL teams is attendance at the so-called "Pro Days" for players in whom they have an interest. As described at NFL.com "[t]hese are not as all-encompassing as the combine, but they are important enough for the key decision-makers in the league to travel around the country for more than a month to see the talent up close and personal." Alabama (March 11): Andre Smith ~ can he recover from his Combine debacle? Arizona (March 14): Eben Britton, currently projected by more than a few as being of interest to the Steelers, will be looking to enhance his standing amongst the scouts. Arkansas (March 10):Center Jonathan Luigs has been projected by some as a possible second round choice for Pittsburgh. He had a solid Combine performance (5.07 40-yard dash and a 31" vertical jump); but questions persist about his strength. California (March 18): Alex Mack did not participate in drills at the Combine, and his pro day performance may mean the difference between going somewhere in the top 25 picks of the first round or falling to Pittsburgh at #32 ~ or beyond. Connecticut (March 25): In the earliest mock drafts William Beatty was viewed as someone who could end up in Pittsburgh with the final choice of the first round. Mr. Beatty had a nice time in the 40-yard dash (5.03) but did not perform as well in the 20-yard shuttle or the bench press. Despite that, conjecture is that he is moving up most draft boards. Iowa (March 23): Robert Bruggeman, an offensive lineman, was one of the top performers in the bench press at the Combine but did not participate in the 40-yard dash or any other running drills. Has been mentioned as a possible second round choice for the Steelers. Oregon (March 12): Our favorite, Max Unger, looks to impress after a mediocre performance at the Combine. Penn State (March 18): A.Q. Shipley was a top ten Combine performer in the bench press, vertical jump, three-cone drill, 20-yard shuttle, and was tied for fourteenth best in the 40-yard dash. We wonder what more he has to prove? Richmond (March 19): Lawrence Sidbury Jr. was a monster at the Combine ~ performing in the top ten in the 40-yard dash, vertical jump, broad jump, and 20-yard shuttle ~ and his size (6'2", 266) leads us to believe that he could be the next young outside linebacker to join the Steelers. The scouts at Ourlads gave him good marks for his performance at the Senior Bowl while still suggesting that he must improve in both his play against the run and expanding his repertoire of pass rushing moves. Texas Tech (March 12): Michael Crabtree ~ will he or won't he? Also, offensive lineman Louis Vasquez, who led all offensive linemen at the Combine with 39 repetitions in the bench press, will workout as well. UCLA (March 31): Any self-respecting alumni of UCLA would highlight their pro day. Running back Kahlil Bell was a top performer at the Combine in the 3-cone drill, 20-yard shuttle, and 60-yard shuttle; but his 4.68 time in the 40-yard dash is likely to keep him off draft boards. However, he is a strong, muscular runner (5'11", 212 lbs.) who could make a career for himself as a fullback. Vanderbilt (March 5): Cornerback D.J. Moore, mentioned by some as a possible first round selection for the Steelers, will try to improve on a fair Combine performance. Wisconsin (March 4): Offensive lineman Kraig Urbik will try to convince Steelers scouts that he is worthy of a second round selection. Dates and participants will be added to the Pro Day schedule as they become available (i.e. bookmark that page). We knew better, but we cited an article that cited an article (indirect references ~ the bane of the serious researcher's existence), and a source that does not inspire great confidence at that. Now comes word from the oracle, Ed Bouchette, that Chris Kemoeatu has re-signed with the Steelers, and that Sean McHugh has also re-signed. We are sincerely, and sufficiently chastened. "The New York Daily News is reporting that the Jets have made a contract offer to Steelers OG Chris Kemoeatu, whom they hope to move in at the ORG spot that has been vacated since the release of ex-starter Brandon Moore." We are not exactly admirers of the original source (i.e. The Daily News), but that does not mean that this story has no merit. Mr. Kemoeatu (along with Bryant McFadden) is one of those we are hoping to see back in Pittsburgh in 2009. Of course, the irony of seeing the New York Jets using two former Steelers at the offensive guard spots while being coached by the former defensive coordinator of the Baltimore Ravens is almost too much to believe. Scott Wright's Draft Countdown: Mr. Wright's current mock draft (which has not been updated since before the NFL Combine) is a two round effort. He is projecting Oregon center Max Unger as the #32 choice and Jarron Gilbert, a defensive end from San Jose State University, at #64. Both players have been moving up draft boards since the combine, and we have seen some who are projecting Mr. Gilbert at #32. NFL Draft Dog: Another two round effort, this one is in agreement with Sam Farmer of the Los Angeles Times with Eben Britton, an offensive tackle from Arizona, at #32. With their second round pick Draft Dog projects Wisconsin's Kraig Urbik as the Steelers' choice. The folks at Ourlads Scouting Services assessed Mr. Urbik's performance at the Senior Bowl thusly: "Good drive blocker and use of hands in the running game. Gave ground too quickly at times in pass protection. Physical player that projects outside as a right tackle." FF Toolbox: This site offers multiple mock drafts from multiple writers. They currently have a two round mock draft up, with Alex Mack (Center, California) as the consensus first round pick. As for the second round the writer's are all over the map. One writer (Randall Weida) has the Steelers choosing Duke Robinson, an offensive guard from Oklahoma, at #64. Meanwhile another writer (Ricky Dimon) sees William Beatty, the offensive tackle from Connecticut, lasting until the end of the second round (we see that as being very unlikely). Asher Allen, a cornerback out of Georgia, is still another writer's choice (Raul Colon) ~ and an interesting choice. Finally, Jamon Meredith, offensive tackle from South Carolina, is the choice of two writers (Ben Standig and Joel Wesler). NFL Draft Blitz: This mock draft offers up seven rounds of projections, but only the first round is available for free. In that round Eben Britton is projected as the Pittsburgh pick. My NFL Draft: A one round mock draft, they are projecting Alex Mack as being available at the end of the first round. Draft Daddy: Sometimes it is nice to see something different, and this one round mock draft is that. In this one Matthew Stafford and Mark Sanchez are hanging around until the second half of the first round (picks 19 and 20 respectively); and Alex Mack, Eben Britton, Max Unger,et al are not projected as first round choices. Instead the Steelers will select . . . D.J. Moore, a cornerback from Vanderbilt. According to FF Toolbox Mr. Moore ran a 4.58 40-yard dash (outside the top ten), and had a vertical jump of 39.5 inches (third best amongst cornerbacks). Draft King: A one round draft that projects Duke Robinson, the offensive guard from Oklahoma, as the Steelers choice at #32. The Football Expert: Like FF Toolbox, this site offers up multiple mock drafts. Players like Alex Mack, Duke Robinson, and Troy Kopog (an offensive tackle from Tulane about whom Ourlads said "More physical than athletic. Struggled with the speed of the edge pass rushers.") figure prominently in the Steelers' plans. 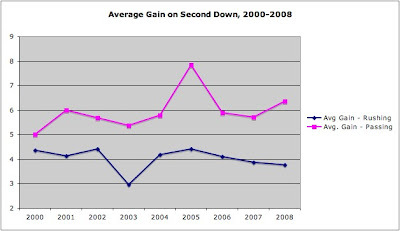 We wondered how Pittsburgh's poor first down performance in 2008 would impact subsequent downs. 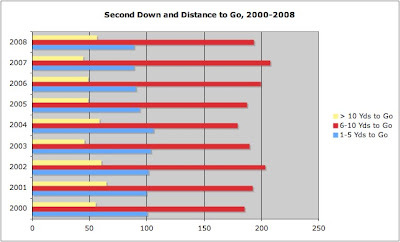 The median number of second down plays for the period 2000-2008 is 339, making 2008 about as average as average can be, at least in that respect. 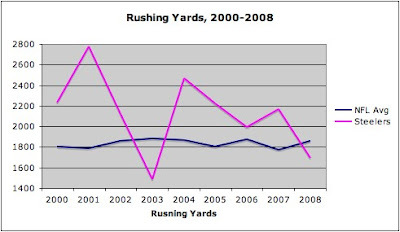 That fact makes the number of rushing plays called all the more alarming. Specifically, 152 rushing plays on second down is the second lowest total in the past nine seasons (only 2003, a season in which the Steelers went 6-10, was worse). Not surprisingly the number of pass plays called on second down in 2008 was the third highest of the past nine seasons, and the highest since 2003. 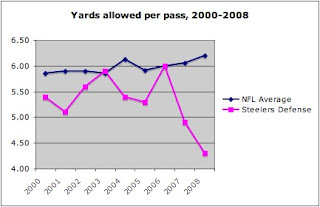 What the graph shows us is that the number of second down plays on which Pittsburgh required five yards or fewer was tied for the lowest number in the past nine seasons (88, tied with 2007). The number of plays requiring 6-10 yards was at its fourth highest during the past nine seasons. 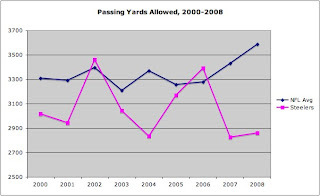 Of even greater concern the number of second down plays on which more than ten yards was required reached a four year high and was at its fourth highest point of the past nine seasons. 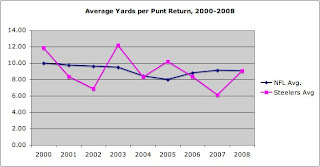 This fact can only mean that the number of first down plays in 2008 which resulted in lost yardage was amongst the highest of any season in the past nine. The notion that the Pittsburgh Steelers are a "run first" team is simply a fiction. While second down passes averaged more than six yards (6.36) for only the second time in the past nine seasons, rushing plays had their second worst average (3.76 yards) over the same period (in 2003 the Steelers averaged 2.95 yards per second down rushing attempt). First down performance was poor, forcing the Steelers to throw the football more often. However on those occasions when a rushing play was called the offense performed as poorly as at any time in recent memory. We are afraid to examine third down ~ let's take the weekend to prepare ourselves. Living in Southern California we have witnessed first-hand the demolition of a world-class newspaper, the Los Angeles Times. But whatever else Sam Zell has wrought, he still has not offered NFL reporter Sam Farmer a buyout. We are glad for that, and happy to offer up Mr. Farmer's first mock draft of 2009. Mr. Farmer believes that the Steelers should use pick #32 to acquire Eben Britton, an offensive tackle from Arizona. Mr. Britton is 6'6" tall, and weighs in at 309 pounds so he certainly fits the part. However, Pat Kirwan of NFL.com (if you were able to watch Mr. Kirwan's live commentary, online, of the NFL Combine you know why we have so much respect for him) has Mr. Britton going to the Eagles at #21 in his mock draft. The 2008 draft was marked by a first round run on offensive linemen, and there is no reason not to expect something similar to happen this year. As much as we would like to see someone like Mr. Britton available at #32 it seems unlikely that he will be wearing a Steelers' uniform in 2009. In addition to the live coverage available through the NFL Network and NFL.com, Doug Farrar of Football Outsiders is doing Twitter-esque updates for the Washington Post. The information available at the Post site is terrific ~ succinct and informative ~ and right now there is a good look at the top offensive linemen available in the 2009 draft. The NFL has released a Q&A fact sheet about free agency (e.g. what is a transition player, when does a player become an unrestricted free agent, etc.) which we thought we would share in its entirety. The final question regards the 2009 salary cap. Now we turn our attention to the an area of play about which we care inordinately ~ Special teams. In the first of two installments we examine the effectiveness of the kick and punt coverage units, both in relation to the league overall as well as within the historical context of previous editions of the Pittsburgh Steelers. 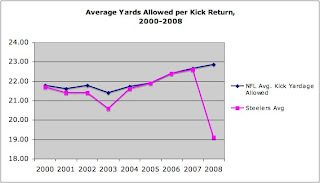 Whereas the Steelers' 2008 defense could not beat their 2001 predecessor in nearly any statistical category, this past season's kick coverage unit has set the standard for the decade with a dramatic, and rather unexpected improvement. With Keyaron Fox a free agent the question is whether or not Director of Football Operations Kevin Colbert has the wherewithal to re-sign an impactful but one-dimensional player. So there it is ~ after eight years of relatively average performance the Steelers' kick coverage unit had a breakthrough season. So, what do they do for an encore? The see-sawing from on season to the next continued in 2008; and the question now becomes whether the improvement of the past season will be in evidence in 2009. But you might wonder just how much better can the Steelers be in this area ~ after all they had the fourth best punt coverage in the league this past season. Well, Atlanta had the #1 punt coverage unit, which gave up an average of 2.5 yards per opposition punt return. Clearly, there is still plenty of room for improvement. We are not sure what factors contributed to this low ~ changes in rules, improved passing attacks, declining defenses ~ but it certainly appears things are changing. While the rest of the league struggles the Pittsburgh defense continues to excel, which makes for a beautiful picture indeed! Word from the NFL is that Steelers quarterback Charlie Batch has returned to school. According to a league press release he is one of 95 players, active or retired, who has enrolled in the NFL Business Management and Entrepreneurial Program. The press release describes the program as "part of an ongoing NFL-NFLPA initiative to assist players in preparing for their post-playing careers." Mr. Batch will be attending classes during the month of March at the University of Pennsylvania's Wharton School of Business. According to the NFL "[t]he Wharton program focuses on a broad range of business topics, including financial analysis, entrepreneurship, real estate development, stock market investing, negotiation skills, risk management, and community reinvestment. Attendees work on directed as well as individual real estate, entrepreneurial and personal finance projects." Hopefully someone will remind Mr. Batch that, if Byron Leftwich departs for an opportunity to start with another franchise, his services may still be needed in Pittsburgh next fall. We continue our look at the 2008 regular season with an assessment of the performance by the Pittsburgh defense against the run. 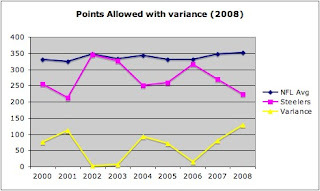 In the simplest terms it did very well ~ performing much better than the average of all NFL defenses ~ as has been the case for most of the past nine seasons, bu was not only second best amongst Steelers' defenses during the 2000-2008 period but was also second best in the NFL this past season. Even in their worst season (i.e. 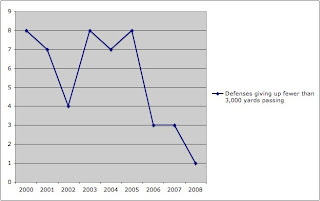 2003) the Steelers' run defense has been significantly better than average. Only marginally more surprising is that the 2001 Steelers' defense outperformed the 2008 group, and that the 2004 unit was nearly as good. 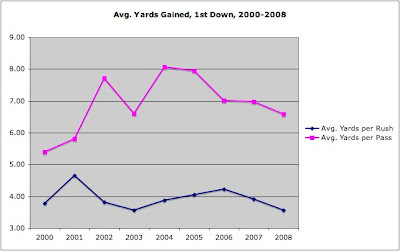 The 154 yard improvement this past season compared to the 2007 season is certainly noteworthy, however the decline from 2000-to-2001 (498 yards) and 2003-to-2004 (442 yards) were far more significant. Finally, the aspect of this that surprised us the most is that over the past three seasons the defense that has performed best against the run has been in . . . Minnesota? In the 2005 season the Vikings surrendered 1,841 yards rushing. 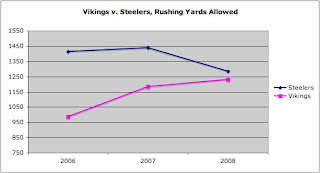 Then in the 2006 season a certain someone that all fans of the Steelers know took over as defensive coordinator, and net rushing yards allowed by the Vikings that season plummeted to 985 yards ~ the largest year-on-year decline by any team during the 2000-2008 time period. In the two seasons since that defensive coordinator made his way to Pittsburgh the Vikings have still been #1 against the rush but have not performed quite as well. 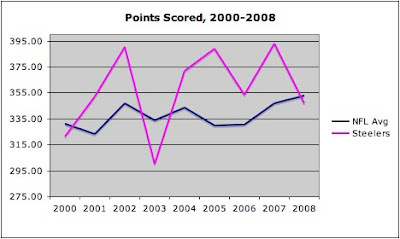 Despite the fact that the Steelers' defense was worse against the run in 2007 than 2006 (something that we believe was directly related to the absence of Aaron Smith because of injury) the 2008 defense improved; and the job that the defensive coordinator did in Minnesota in 2006 gives us hope that more improvement lies ahead. Everyone knows that the Steelers' defense had a terrific season during 2008, but just how great a season it was becomes more and more clear as we dive into the numbers. 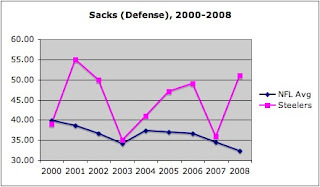 Today it is the total number of sacks by the defense and the improvement, year-on-year, is stunning. After a slight setback (i.e. 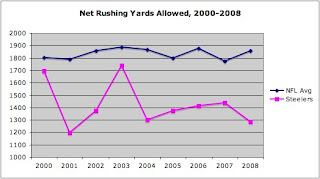 the 2007 season) the pass rush continued what had been a steady climb into the upper echelon of the league's defenses. 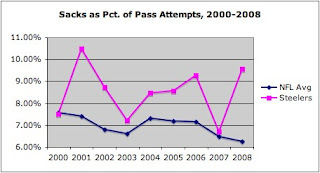 What we see both in the raw numbers and the percentage of sacks to pass attempts is that the Steelers are bucking the trend within the NFL ~ while the league average for sacks and the percentage of sacks to pass attempts falls the Steelers are improving; and in 2008 they improved dramatically. Having said all of that we just have to wonder if, as fans of the Pittsburgh Steelers, did we fully appreciate how great that 2001 defense was? It is no secret that Steelers quarterbacks have been sacked at an alarming rate over the past few seasons, and given a decline in rushing yardage this past season it is difficult to not look at the offensive line as an area of the team that requires some improvement. The question that no doubt has been asked within the Steelers' offices, and is also being asked by fans, is whether or not this group has the potential for improvement; and if so how much improvement? Looking at it a different way, is Pittsburgh better off perusing a list of top free agents or by investing more money into this group of players? While signing a free agent may seem sexier, and discussing the draft is more fun, the answer to the offensive line issue in Pittsburgh may lie in sticking with, and continuing the development of, this cast of characters. 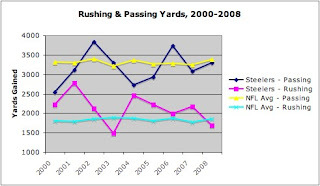 We have taken a look at rushing yards in 2008 (along with points scored and sacks allowed) and now it is time to examine the passing game; and what we found was that the total yardage gained by the Steelers' via the forward pass was far from being remarkable despite the drop in the running game. So 2008 was only the fourth most prolific passing season in the last nine; and with the drop in rushing production this past season ~ to a point where the Steelers performed below the league average ~ as well as the drop in points scored by Pittsburgh, it will surely go down as one of the most mediocre offensive seasons on record (which makes the way the Steelers won Super Bowl XLIII all the more ironic). What we see quite clearly is that for the first time in the past nine seasons both the running and passing attacks performed below league average during the same season. All things considered the 2008 regular season was extremely tough for the Pittsburgh Steelers' offense. Peter King is reporting in this week's "Monday Morning Quarterback" that Ben Roethlisberger played in Super Bowl XLIII "with at least two small rib fractures -- which didn't show up in an X-ray the week before the game but did when he got an MRI after returning to Pittsburgh." Mr. King, after having re-watched the game this past weekend (including some praise for Mewelde Moore), breaks down the final drive in great detail, and has a few additional comments to make ~ ultimately we were glad to find out that we were not the only ones who watched the game again (and again) this past weekend. This may be hard to believe but we have never read About three bricks shy of a load: A highly irregular lowdown on the year the Pittsburgh Steelers were super but missed the bowl written by Roy Blount Jr., and originally published in 1974. We actually were given a copy shortly after its paperback publication but never actually read it ~ perhaps the incredibly lengthy title or the stream of consciousness, droll treatment of the subject kept us from getting through it . . . we really cannot remember. Whatever the reason we never read it and now we are pretty glad that is the case. “[What] I’m going to sell to our football team is that we are not attempting to repeat. That special group of men in that locker room last night at the end of that game – that’s gone forever. There will be a new 53-man (roster). A lot of the faces will be the same, but nothing stays the same in this game. Few will come and go, those who remain, the roles will change. Some will ascend, some will descend. That’s the nature of today’s NFL . . . [w]e are going to roll up our sleeves at the appropriate time and start with a new group of men . . . and go about our business of trying to compete in ’09. You won’t hear me say words like repeat or defending because it will be brand new. This group will always be special to me, but sometime soon, that group will assume its place with others in history. It will be just that – history." Blown away by the maturity and drive evidenced in that statement ~ we immediately scaled back our own celebration plans. "No not really. One thing I learned very early, you never have it made. You never relax, never rejoice very long. One thing I realized early in my football career, you play a game, it's a very emotional thing, you get all up for it, you work like hell, you get keyed up. Then when it's over, you take a shower and go out and sit down on the bus, and it's like someone stuck a pin in you. For me. For me, the doing is the pleasure, not the rejoicing therein. Once you get the goal, it's over" (64). If we had read this book thirty years ago there would be no way that we would have remembered that passage, and there would be no way for us to realize that this new, young coach may just be more like the Steelers' old, new coach than we could have ever known. For those of you who may not have read the book (or perhaps even heard of it before) click here to check for a copy at a library near you. Labels: Chuck Noll, Mike Tomlin, Roy Blount Jr.
"It was good to see the Steelers win the Super Bowl. I’ve got a lot of friends on the team. I was happy to see it. I have some people that I like on Arizona that I’m friends with on the team. Like I said, I’m really not mad either way but I was happy to see the Steelers get it. I talk to all of them. They’re still my guys, regardless." One wonders if Mr. Porter will be so generous of spirit next season when the Steelers travel to Miami to take on the Dolphins? The Yahoo! mock draft we alerted you to recently has the Steelers choosing William Beatty, an offensive tackle out of Connecticut. Now the Sporting News Today has a brief assessment of Mr. Beatty's skills. According to this assessment Mr. Beatty is 6'6" tall and weighs 291 pounds ~ rather light for NFL competition. The author's of the profile go on to say that he demonstrates good footwork and quickness but is "unable to physically dominate [a] defender to drive him out of [a] play." With the draft combine less than two weeks away it will be interesting to see if Mr. Beatty has been able to bulk up at all since the end of the Huskies' season; but we must admit that the Sporting News assessment has left us somewhat underwhelmed by Mr. Beatty. However, Scott Wright at NFL Draft Countdown has come out with his first two round mock draft, and while he has the Steelers selecting Max Unger (our preference) at #32, he projects Mr. Beatty as going to the Detroit Lions at the thirty-third spot. So, at least for now, Mr. Beatty appears to be a realistic option for Pittsburgh at the end of round one. The title is from a photographic archive available, online and free, from Sports Illustrated. Steelers trying to upgrade return teams? According to reports from north of the border the Steelers have plucked a player from the Canadian Football League in an effort to enhance the punt return and kick return units. Reports are that the Steelers have, or will shortly, sign Stefan Logan who played last season with the Toronto Argonauts B.C. Lions. According to a brief item from Rotoworld, Mr. Logan (nicknamed "Joystick" ~ we're not sure we want to know) "was Canada's most exciting player, averaging a ridiculous 7.3 yards per carry in 2008." However, the understanding Mr. Logan has is that the Steelers are looking at him as a possible return man on kicks and/or punts. Mr. Logan attended college at the University of South Dakota, and according to information on the official web site of the university, Mr. Logan was a finalist for the Harlon Hill trophy, emblematic of the Player of the Year in Division II (see a promotional brochure outlining Mr. Logan's accomplishments here). Mr. Logan, who is from Miami, was signed as an undrafted free agent in 2007 by the Miami Dolphins but did not make the team. One of our favorite articles from our friends at Football Outsiders states that a "good running game certainly contributes to the winning effort. But teams don't win because they run 30 times. Teams run the ball 30 times because they are protecting the lead on their way to a win." The 2008 Pittsburgh Steelers are evidence of that. Some will argue that the injury to Willie Parker, and perhaps Rashard Mendenhall as well (certainly hopes were high for him during the preseason), negatively impacted the Steelers' ability to move the ball on the ground. However in the five games that Mr. Parker was inactive, Mewelde Moore rushed for a total of 373 yards on 88 carries (including a 13 yards on 8 carries effort versus Baltimore on 9/29/08) ~ a per rush average of 4.24 yards. This compares to Mr. Parker's 791 rushing yards on the season, on 210 carries ~ a 3.8 per rush average. Typically, we would expect an average to increase when the number of running plays decreases; so the question we have to ask is whether the Steelers have reduced the number of running plays they call because they do not run the ball well, or do they not run well because they do not call as many running plays? 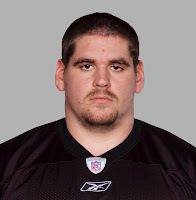 Word has come out that the Steelers have re-signed center Doug Legursky. Mr. Legursky spent this past season, his first in the NFL, on the practice squad. With so many free agents on the Steelers roster it is invariable that some will leave, and Mr. Legursky will have opportunities to prove himself. When does a team give up 49 sacks of their quarterbacks and call it an improvement? When they are the Pittsburgh Steelers. Proving that the old saw that there are "lies, damned lies, and then there are statistics" is more true than nearly anyone realizes, the Steelers saw their raw number of sacks return to a high-water mark while the ratio between sacks and pass attempts improved. Prior to the 2006 season the Steelers had surrendered 40 or more sacks in two seasons, both of which were utterly forgettable (in 2000 the Steelers had a record of 9-7, missing the playoffs, and in 2003 they were 6-10). Now they have done so in three consecutive seasons, have made the playoffs in the two most recent seasons, and have won a Super Bowl ~ clearly the team is evolving. It is worth noting that the 49 sacks surrendered by the Steelers this season is the most given up in a season by the team that eventually won the Super Bowl. In fact only three Super Bowl champions have given up 40 or more sacks in their championship season (43 by Baltimore in 2000, 46 by New England in 2001, and 41 by Tampa Bay in 2002). During the 2005 season the Steelers gave up just 32 sacks. After a big drop in the 2007 season pass attempts returned to a level reminiscent of Ken Whisenhunt's final season in Pittsburgh, with this season's pass attempts increasing by 12.65% over the previous season. In this representation it is easy to see that the general trend league-wide over this period has been downward (i.e. 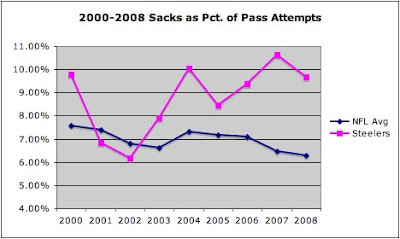 the ratio of sacks to pass attempts has been falling). Meanwhile in Pittsburgh 2008 was the fifth season out of the last nine in which Steelers quarterbacks were sacked 9.00%, or more, of the time they dropped back to pass. We suppose there is some comfort in knowing that the problem is not a new one; and that there was some slight improvement this past season. However, everyone involved (i.e. the quarterbacks, the wide receivers, the offensive line, the offensive line coach, and the offensive coordinator) all need to develop a plan for improving in this area. February 5, 2006 the Steelers finally got their "one for the thumb," defeating the Seattle Seahawks 21-10 in Super Bowl XL. In the process they helped Jerome Bettis finish off his (hall of fame) career with his only Super Bowl championship. At the same time head coach Bill Cowher exorcised some demons by getting his first Super Bowl championship in his second appearance as head coach in the game. The game featured a record setting performance by Willie Parker (longest touchdown run, 75 yards in Super Bowl history), gadget plays, and controversial calls by the officials (at least if you were rooting for the Seattle Seahawks). For a more detailed look at the game the Wikipedia page is here. Meanwhile the NFL's recap of the game is here, and you can take a peek at the game ticket and the champion's ring here. Like most fans of the Pittsburgh Steelers we are only beginning to come back down to earth. However we came across a Yahoo! Sports two-round mock draft, and decided to share. In their scenario the Steelers will be choosing William Beatty, an offensive tackle from Connecticut at #32 and Eric Wood an offensive center/guard out of Louisville. To be honest we do not know much (yet) about either player, so Yahoo! may have it exactly correct. However, one issue we do have is that they project Oregon offensive center/guard/tackle Max Unger at #55 (to the New England Patriots). We are going to be very honest here ~ we saw a lot of Max Unger this past college season, liked what we saw, love his versatility (we think he will be a guard in the NFL), and would like to see the Steelers find a way to get him into the Black & Gold. We received an email alerting us to an eBay auction to benefit Habitat for Humanity. The question of course is what does that have to do with the Steelers? 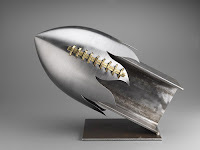 It turns out that, using scraps of steel from the demolished Orange Bowl, artistic "representations" of all 32 NFL teams have been created and are being auctioned, with the proceeds going to Habitat for Humanity. As we write this the bid for the Steelers item (pictured above) is at $910 (shipping is free). The highest bid for any item is by a Baltimore Ravens fan (the bid for that item is at $1,225), and that just seems unacceptable! Bidding ends on Thursday, February 5, 2009. In assessing the whole "ball as a prop" issue with Santonio Holmes' touchdown we posited that the officials simply had not seen what Mr. Holmes did and that is why no penalty was called. Now Mike Pereira, the outgoing supervisor of officials for the NFL, is weighing in on that (and other) issues ~ including the Kurt Warner fumble at the end of the game ~ from Super Bowl XLIII in this interview on the NFL Network. 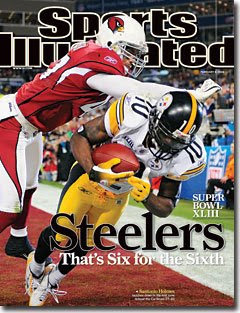 The bottom line: The referees did not see Santonio Holmes use the ball as a prop, and Kurt Warner did fumble the football. With the 2008 season nearly concluded (technically the Pro Bowl is the final game of the season), many fans are interested in what is happening on the free agent front. The Sporting News has a free, email product called Sporting News Today which is a daily sports "newspaper," and it has quickly become one of our must reads. On Wednesday they published an annotated list of the available free agents, and we are happy to offer it to you here. While reflecting on Super Bowl XLIII one wonders if it is not as significant for what we did not see as for what we did. Specifically, after some pre-game talk about Arizona's trick plays we saw none. Big plays, yes. Trick plays, not so much.